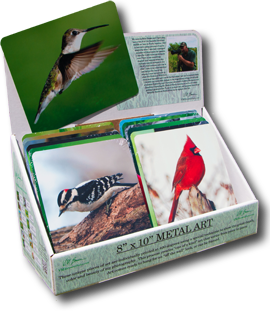 The "12 Print Starter Kit" comes ready to display and includes 12 METAL PRINTS ( 12 shrink wrapped, ready to sell units ) ready to present and sell to your customers. The top of the packaging contains information about the artist and the left side has information on how to re-order prints to offer your customers. The package will come with everything that you will need to start selling these metal prints. The approximate dimensions of the finished unit are 19 (w) x 7 (d) x 24 (h) inches. Each print comes complete with a mounting bracket on the back of the print, ready for hanging!